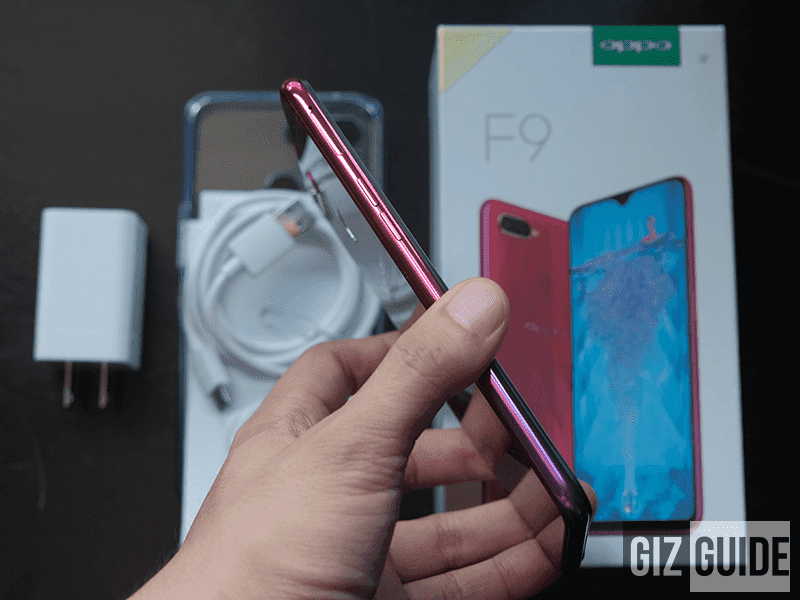 After the popular OPPO F7 release, the Chinese global phone manufacturer launched the F9 with upgrades like VOOC charging, dual cameras, and smaller notch! OPPO also updated its design and added a gradient glass design and made the RAM and battery size bigger. 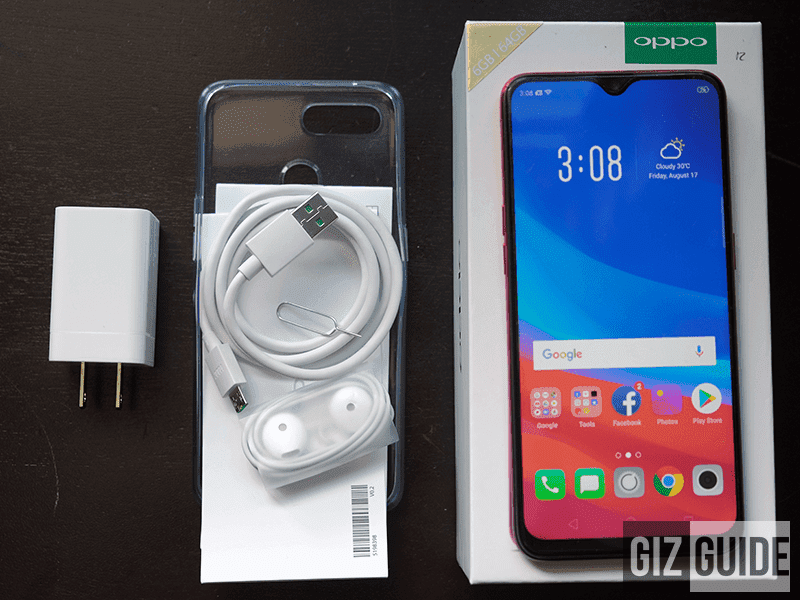 It comes in the familiar white box that OPPO has been releasing for years. 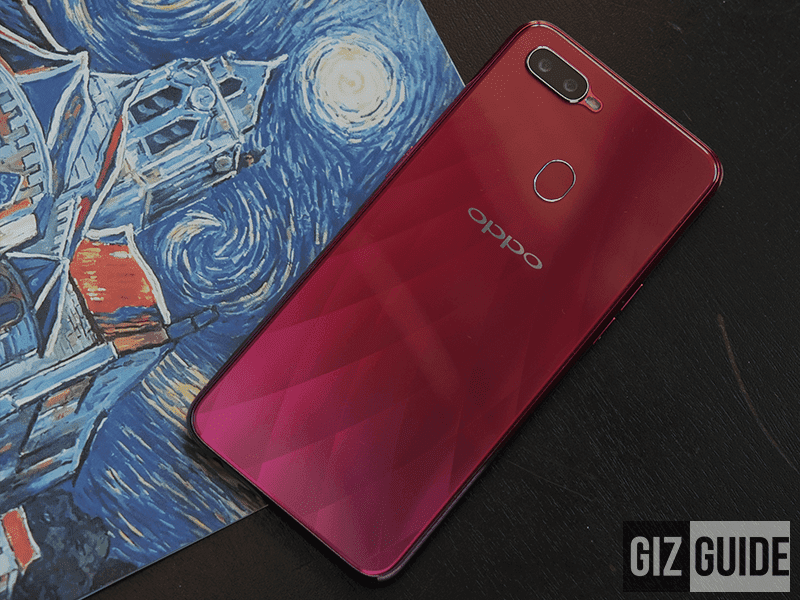 Printed on the box are the OPPO branding, a render of the phone, the specifications and regulatory information.Inside the box is the phone, VOOC compatible USB Type-A to micro USB cable and power plug, earphones, documentation, jelly case and sim ejector tool. Acrylic back with petal design! We have to be honest, the build quality is so similar with the F7 with minor updates. If you liked the F7's build of plastic frame, glass display, and acrylic back then you will like this one. It still has Gorilla Glass protection for the screen. Headphone jack, micro USB port and speaker grill! SIM card tray and volume buttons! The new petal reflective design reminds us of holographic Pokemon cards from our childhood. It along with the new two color gradient add another layer of premium to it. It is polarizing though. You either like it or you don't. The new petal reflective design reminds us of holographic Pokemon cards from our childhood! The display is now larger but without increasing the size of the chassis because of the droplet like notch which increased the screen to body ratio to 90.8 percent! It may be one of the more impressive things because they were able to keep the ear piece, camera and sensors in that small space. It reminds us of the small notch from the essential phone. On top you will find just a microphone hole while at the bottom is speaker grill, 3.5mm headphone jack, and micro USB port. On the left is the volume buttons and SIM card tray while the power button is on the right. Overall ergonomics of the phone is great. Form factor is still easy to hold despite the big size. 1. 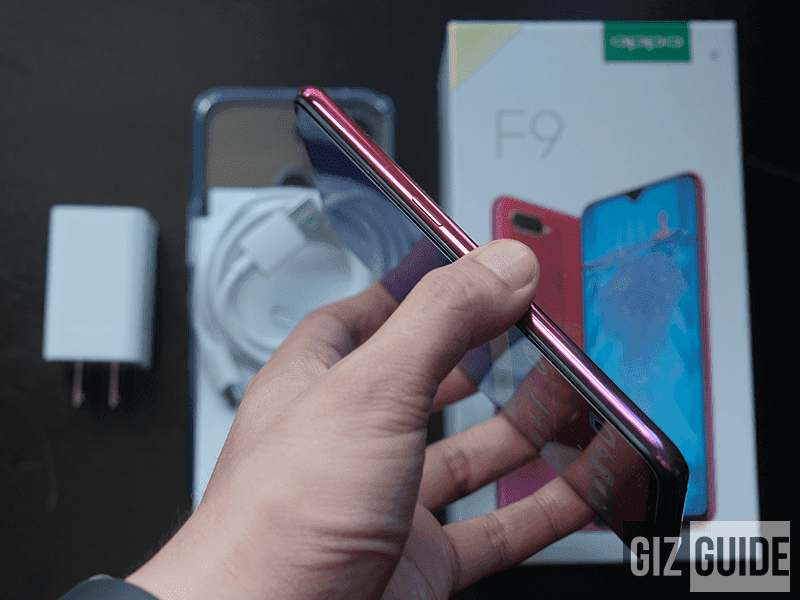 The F9 builds on the design of the F7 and adds minor updates that add a level of premium to it like the gradient colors and petal design reflections that you either like or you don't. If you liked the build of the F7 then you will like this one. The display is now a 6.3-inch 2.5D curved Gorilla Glass protected LTPS TFT screen w/ 2340 x 1080 resolution at 409 ppi with bright vibrant colors that pops! It is one of the better displays we've seen at this price point. It now has a 90.8 percent screen-to-body ratio because of the smaller notch. 2. It retains the MediaTek P60 which made the F7 the one of the best mid-range phone earlier this year. It can handle games with ease because of the Mali-G72 MP3! It has 6GB RAM and 64GB ROM and is expandable up to 256GB. The device is powered by a large 3,500mAh battery that supports VOOC charging that promises 2 hours of talk time with 5 minutes of charge. This could possibly be a game changing feature if it works all the time and not under specific conditions. 3. 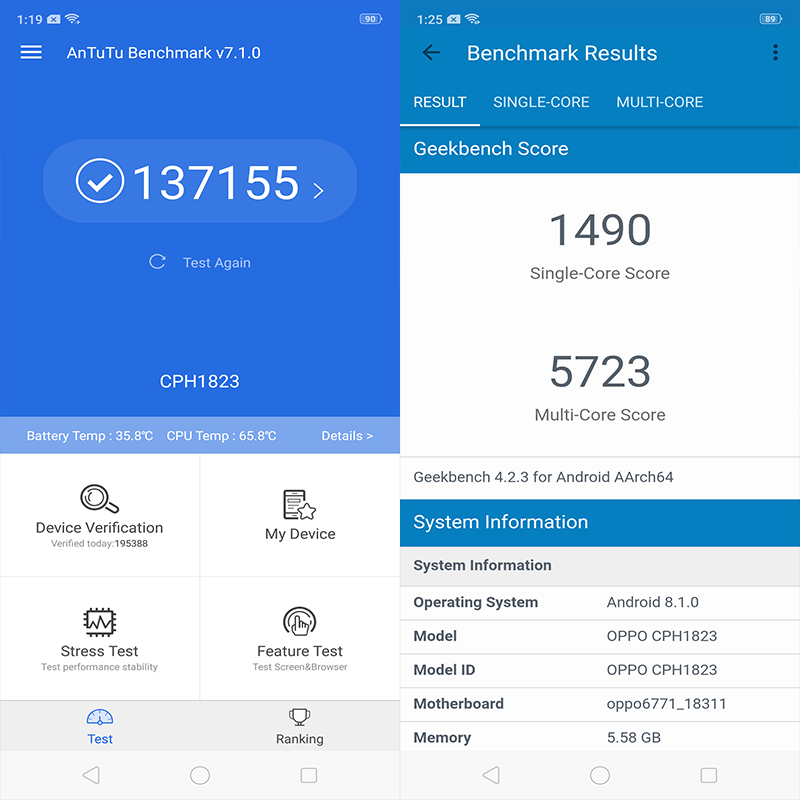 It is running on Android 8.1 Oreo with the latest ColorsOS 5.2 that blends UI elements and style of both Android and iOS. 4. 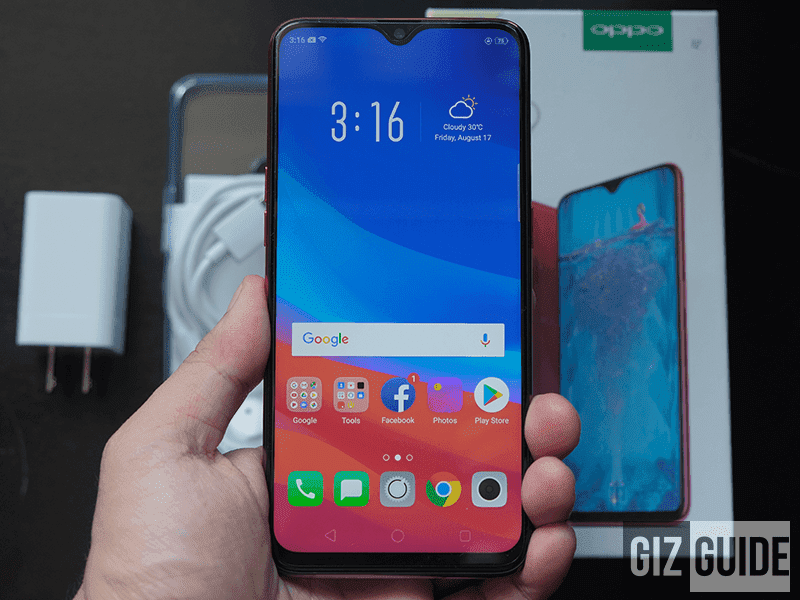 The rear camera is a dual set up of 16MP f/1.8 and 2MP f/2.4 with PDAF and LED flash while the Selfie Camera is a 25MP f/2.0 w/ AI Beauty Recognition and screen flash. Initially, there isn't a lot of difference from the selfie camera from the F7, the main camera however we have to do more testing. 5. It is complete with connectivity with support for the following: WiFi 802.11 a/b/g/n/ac (2.4GHz/5GHz), 700MHz 4G LTE, Bluetooth 4.2, A2DP, LE, OTG, GPS, A-GPS and dual SIM. It also has the following sensors: Accelerometer, light, orientation, proximity, gyroscope, sound and magnetic sensors. There is no sign of the LED notification. So far, we think that the F9 is a great device like the F7, but we aren't too excited because it is more of a refinement of the F7. In our initial impressions, there is little to reason to upgrade if you are an F7 user. But if you were an F1, F1s, F3 or F5 user, this may be the one to get! OPPO also changed very little internally. But honestly, it isn't a bad thing because they retained most of the insides which made the F7 great. We will have to do more testing and trials to see how the F9 differs from its predecessor! 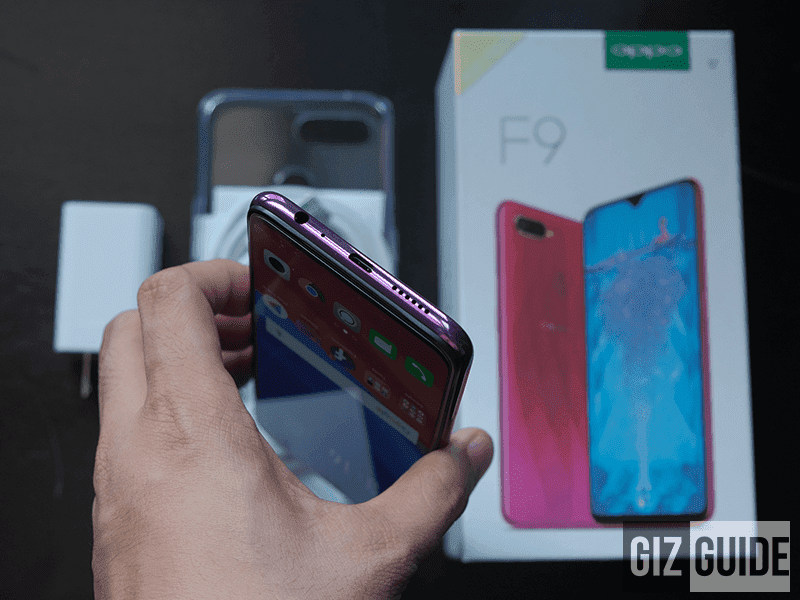 For our review: OPPO F9 Review - Greater F7?